What are the major industry trends shaping the commercial industrial market? This Chandan report provides an overview of the state of the commercial industrial market and trends that will shape the industry moving forward. The report includes a list of the top 10 emerging markets in the industrial space and insights into key financial trends that could impact your business. Download Chandan's Industrial Market Outlook to learn more about all of the key market influencers in the commercial industrial space. A year by year breakdown of industrial cap spreads, construction spending, and more. 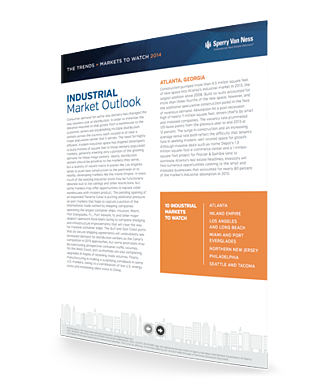 The top 10 markets poised for growth in the industrial space. Potential investment opportunities for your business.